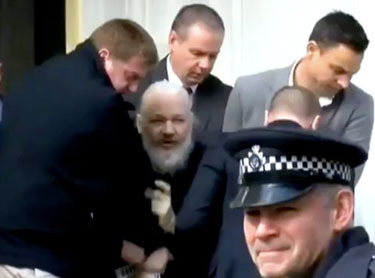 3 Feedbacks on "Ecuador Revokes Assange’s Asylum; Wikileaks Head Dragged Out of Embassy and Arrested"
I am not a fan of Bradley Manning and I believe he should have stayed in jail for life. I admit to not knowing exactly what Wikileaks has done that may be illegal but I will say that to the extent they harmed national security or caused harm to individuals I am not a fan of them either. However, if the NY Times had published exactly the same things that Wikileaks did I feel confident that there would be no prosecution of them. So for what they published I see no crime. For how they acquired it, maybe they committed a crime. If they did and if Assange goes to jail for it Should we go back and charge Daniel Ellsberg with a crime? James Goodale,Ellsberg’s attorney at that time,has already sided with Assange. His view is that this is a journalistic 1st Amendment issue,and dear Julian is Joan of Arc with a beard. I call BS. Assange is a narcissistic nihilist who revels in the spotlight and seeks to bring down Western institutions. Manning is a mentally ill attention whore who should never have been allowed into any branch of the armed services. Let them share a cell at a nice Supermax. Does he have to become a woman to get a pardon?